Teachers plant seeds of knowledge, nurture them, and watch them grow and mature. now every Kannapolis City School has a sustainable garden on campus. In these gardens the seeds of knowledge are, quite literally, seeds, planted in the soil, nurtured to maturity, and harvested through experiential learning and hands-on lessons in math, science and nutrition. Greenhouse Operations & Outreach Specialist Doug Vernon, with the NC State University Plants for Human Health Institute (PHHI) at the NC Research Campus (NCRC) in Kannapolis, is spearheading the new garden installations. PHHI researches how fruits and vegetables help improve human health and prevent chronic diseases. The school garden initiative not only creates outdoor classrooms but cultivates relationships between the NCRC and the community to improve the health of students and inspire families to eat more fruits and vegetables. The Green Teacher Network of Charlotte compiled research that shows school gardens decrease disruptive student behavior while increasing student engagement and improving academic achievement. The positive impact is the same whether the garden is in the schoolyard or the back yard. 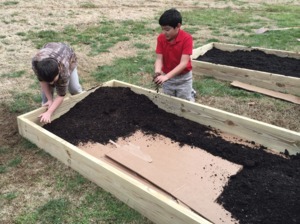 A school garden allows students and teachers to work together toward mutual goals. Similarly, a garden creates a common project for families to share. Parents and teachers know it is difficult to get children to eat vegetables. Research shows that gardening helps children develop better attitudes about fruit and vegetable snacks, which predicts higher produce consumption as adults and helps prevent or delay diseases like diabetes, heart disease and obesity. Vernon finds that gardening introduces children to the reality that food doesn’t just appear on grocery store shelves. Seeds are planted, and crops are nourished and harvested. “It’s an invaluable lesson – about food and about life,” he adds.